The Public Relations Committee has been busy developing a new packet of goodies for each Grange. These will be mailed soon - so keep an eye on your mailboxes! One of the items inside the packet is an information sheet on Grange email. Each Grange has their own email address as part of the Grange post office. We recently implemented some updates to the webmail program where the email is accessed. It now contains a cool new secure chat feature between accounts, and has also added the ability to create mailbox rules and filtering, among other new updates. We hope that each and every Grange, Committee, and Officer takes advantage of using their Grange email. It can be easily set-up on other devices, such as Smart Phones and Tablets (like iPads), or in mail programs such as Outlook or Mac Mail, and can also be forwarded to other email accounts as well. We can even easily trace email between Grange accounts in case messages gets held up or lost. Other items inside the packets include samples of our new customizable brochures and promotional pieces, an informational flyer on the CT State Grange website program, informational flyers on various social media options available to Granges, and much more. The PR Committee has set up 3 new websites and 3 new Facebook Pages – for each of the new Pomona Granges. We encourage everyone to visit these Facebook Pages and click the “Like” pages while there, and to also visit the new Pomona websites to get the latest information. Did you know that there are 30 Connecticut Granges with Facebook Pages? Would your Grange like a Facebook Page? Contact the PR Committee today and we will set it up for you the proper way in accordance to Facebook standards and CT State Grange Social Media guidelines, and then turn it over to you and your Grange to manage. 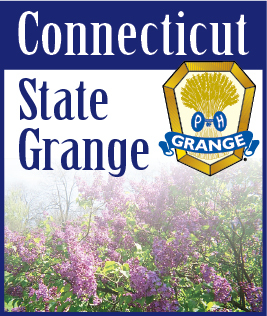 Did you know that 25 of Connecticut’s Granges have had custom brochures designed and printed by the CT State Grange PR Committee? Would you like a custom brochure for your Grange? Contact the PR Committee and we can create custom promotional pieces for your Grange too. Need help on your Grange’s promotional and publicity needs? We can help! Email Terri at information@ctstategrange.org or Bob at publicrelations@ctstategrange.org today.